1. Preheat oven to 350 degrees F (175 degrees C). Grease and flour two nine inch round pans. 2. In a large bowl, stir together the sugar, flour, cocoa, baking powder, baking soda and salt. Add the eggs, milk, oil and vanilla, mix for 2 minutes on medium speed of mixer. Stir in the boiling water last. Batter will be thin. Pour evenly into the prepared pans. 3. Bake 30 minutes in the preheated oven, until the cake is done - check with a toothpick. Cool for 10 minutes, then remove to a wire rack to cool completely. 4. 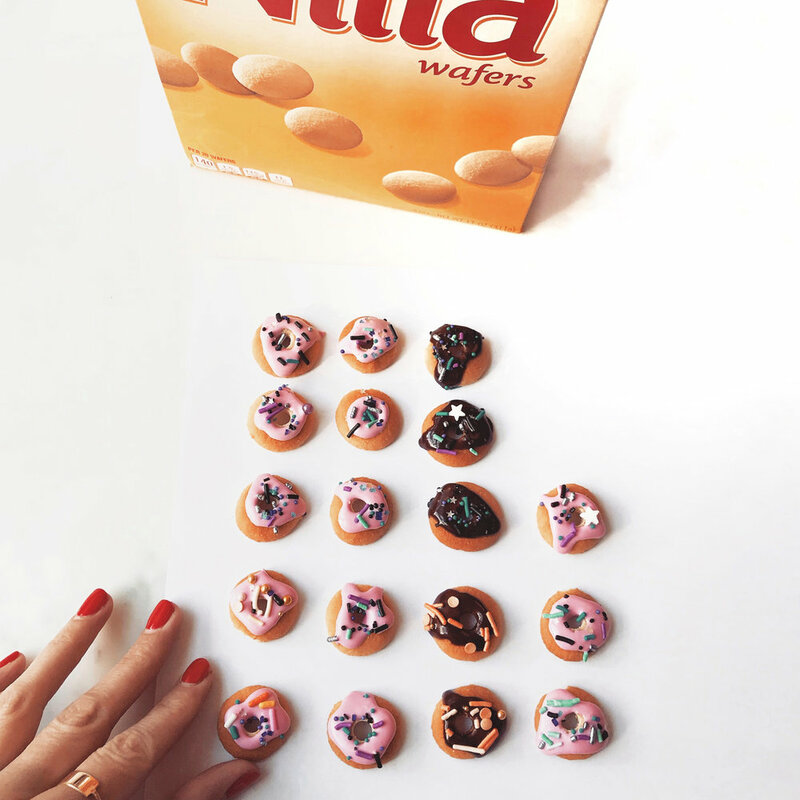 While your cakes are cooling you can make your Nilla Wafer donuts. Simply turn over a mini Nilla Wafer and using a metal straw or a paper straw rock it back and forth gently twisting until you make a small hole in the center of the cookie on the back side. Do not press down on the rounded top of the cookie or it will break every time. You will break a couple, but if you turn the straw while you push down gently you will get a perfect donut every time. If you are using paper straws you will need a bunch because they lose their "sharpness". You can make about 4 donuts per paper straw (2 on each side of the straw) before it gets dull. 4. Now for the frosting. Combine egg whites, powdered sugar, and salt in the bowl of a large stand mixer fitted with a paddle attachment. Mix on medium speed, scraping down the sides of the bowl with a spatula occasionally, for 5 minutes. 5. Turn mixer to low and slowly start adding the room temperature butter. Add the vanilla extract and mix at medium speed for 8-10 minutes until buttercream is light and fluffy. 6. Frost both your cakes and stack together. Coat entire cake in frosting and decorate with donuts. TIP: If you want to do the chocolate drip technique like I did above there is a really good tutorial on My Cake School.